In whichever way a rugby uniform is designed, it will inevitably be covered in mud at the end of 80 minutes. That doesn’t mean those uniforms, and the team brand that comprises the wider brand system, can’t look good, even when covered with mud. For Rugby Canada, the fresh approach is just that. A good-looking, simple brand. Using big, bold type and strong statements, Vancouver agency Hulse & Durrell approach Canada’s rugby tradition with a no-nonsense, tough exterior. Within the brand lies, “courage, tradition, honour, perseverance, and straight up fun,” according to Rugby Canada. 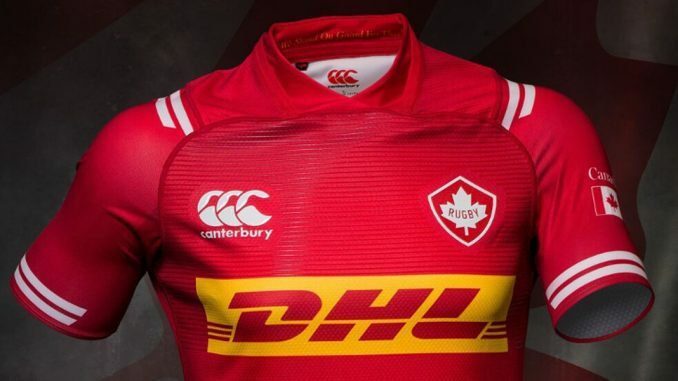 The design is simple – a red maple leaf on a white field, bounded by a diamond-like red shield and bearing the word ‘rugby’ in white. The system is pretty much just that, plus a sans-serif typeface. But what it is is big, bold and brave, while still maintaining a link to the team’s heritage. For Canada, sport is a core part of the national identity. The country has two national sports – lacrosse and ice hockey – and has hosted the Winter Olympics as recently as 2010. This rebrand follows a few shifts for Canadian sports teams and leagues in the past year or so. Canada Snowboard, the national governing body for snowboarding, also received the Hulse & Durrell treatment in November 2017. Canada West, the university sports association, opted for a maple leaf-ed red and grey logo in August 2017. Finally, Volleyball Canada worked with Hulse & Durrell on a modern rendition of its maple leaf logo. The result is a premium-feeling brand that fits within Canada’s sporting tradition, while still standing out and standing up for its sport, teams and community. It even embraces a little mud.